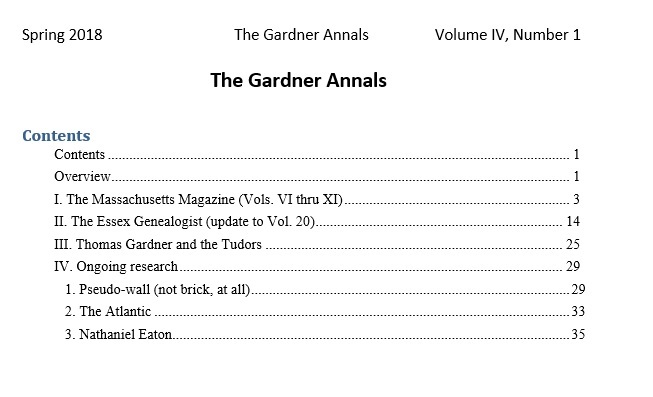 Earlier, we discussed, briefly, the sources for a recent issue of Gardner's Beacon, namely Vol VIII, No 1 that published in early June. 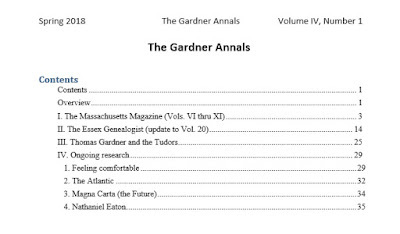 We will do something similar for The Gardner Annals for which we just published Vol IV, No 1. We will reconfigure our Research and Annals section, hopefully with a common reference strategy that will include a bibliography. 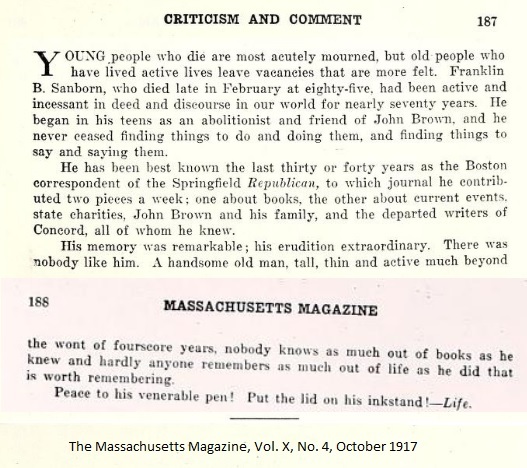 This recent issue covered several topics including finishing up scanning the articles of The Massachusetts Magazine and presenting the Table of Contents for each issue. In this review, we ran across lots of characters who will be looked at more closely as we did take the time to research both older and newer material. For instance, we have a lot of information about Judge Thompson. It was a year ago when we first started to read about him. 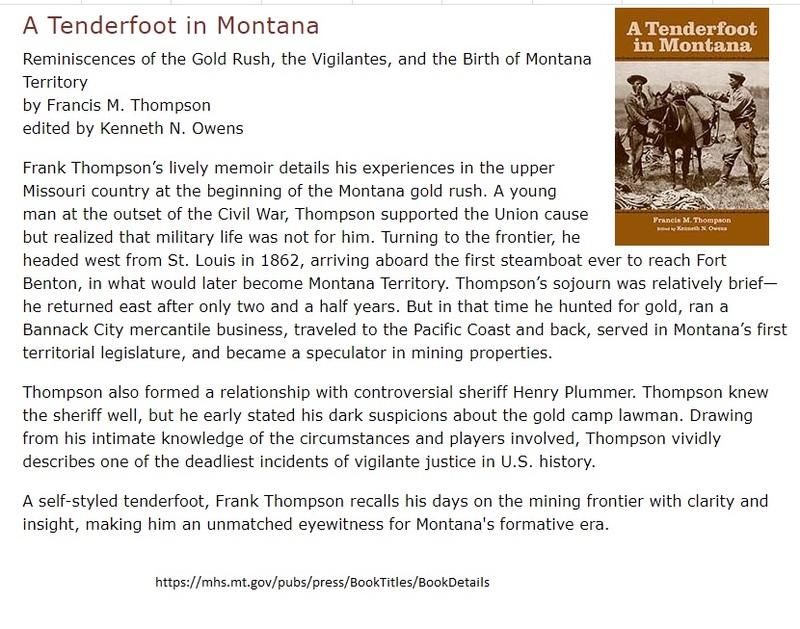 And, several items have come out of his Reminisces, such as his experiences with Henry Plummer who was hanged by the vigilantes in Montana. The following are some additional links which will be updated as we run into material. His early years: son of John Thompson and Elvira Adams. His mother was of the same Adams line as Pres. John (#2) and Pres. John Quincy (#4). 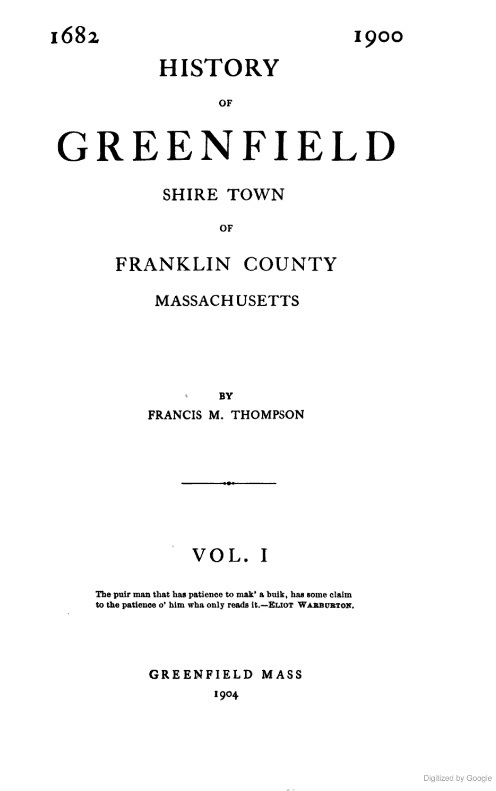 His research report: History of Greenfield. This development was called Boston Township No. 2. 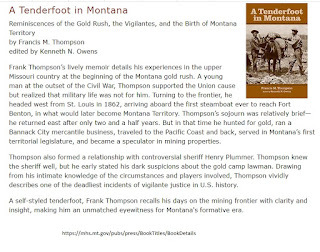 We will be adding other material, such as that associated with F. B. Sanborn, and more. Finally, as we get the print of TGA Vols III and IV ready, we are looking at the next issue. As such, our focus will be of three things that pertain to the past, present and future. That is, the 400 years of history provide a rich source for continuing analysis and subsequent improvement. Those three topics are culture, history and genealogy. The American experiment is without doubt known across the globe and offers a never-ending platform that is as broad as one might expect, namely human culture. Then, history deals with time and events relating to the culture where we have various actors by generation. Given the upcoming even of the 4th of July, we might take Rev. John Wise as an example who was the 'inspiration' for the Declaration of Independence according to President Coolidge. He pre-dated Jefferson's efforts by decades. Rev. John's milieu was Ipswich, Massachusetts. He was the son of a butcher and a graduate of Harvard. We will be writing about him, again. 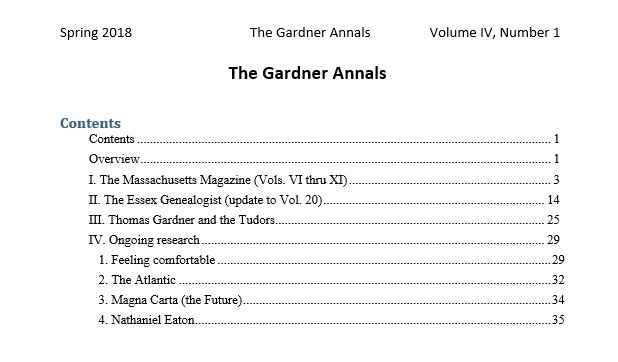 09/22/2018 -- We are about ready to print TGA Vol III and IV with the remaining issues of Gardner's Beacon. We will do this in both black and white and color. Table of Contents for TGA Vol. III is shown in the image. Last fall, we printed TGA Vol I and II. 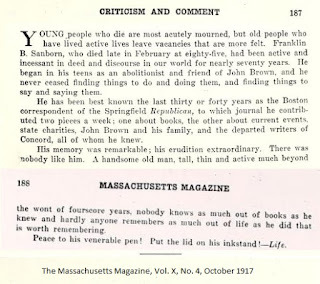 Earlier, when we recognized the support of Lucie M. Gardner for The Massachusetts Magazine, we put in the image that was from 100 years ago. Lucie continued Sidney Perley's work, reported on activities by groups (such as The Old Planters Society). She is also listed as an editor. The recent issue of Gardner's Beacon, Vol. VIII, No. 1., mentions the upcoming 400th celebrations. Cape Ann, Essex Co., and Salem have several years to party, from 2023 to 2030. Following is about the 300th. VP Charles Dawes was in Salem for the ceremony. Dr. Frank was there, as were a whole lot of folk. On June 13th and 14 and 16th and 17th of 1913, there was a Pageant presented by locals. Dr. Frank participated. He and his wife were the Roger Conants. Thomas and Margaret Gardner were played by Waldo D. Gardner and his sister. Lucie M. Gardner played the wife of William Jeffrey. Other families portrayed were Balch, Gray, Norman, Palfrey, and Allen. 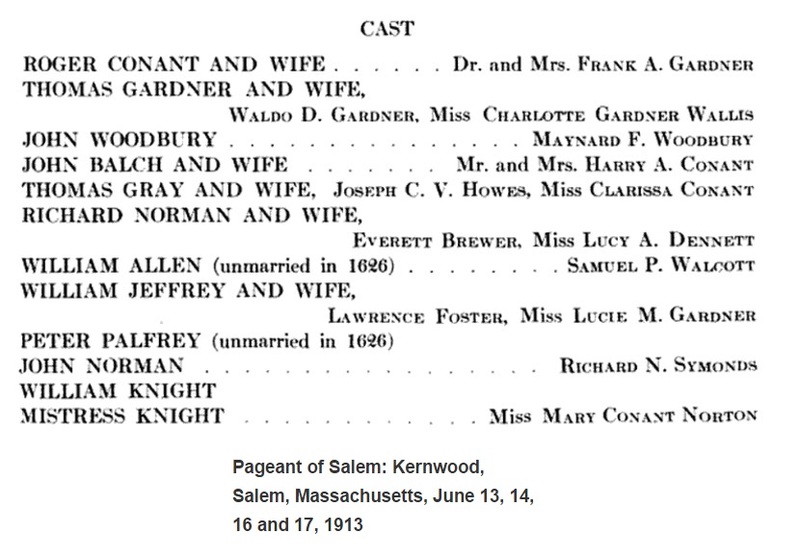 The Pageant was presented by the management of the "The House of the Seven Gables Settlement Association" and was published (available via Google/books). The Pageant was "arrange and directed by Margaret Maclaren Eager" with Sidney Perley as consultant. There were many participants and supporters (see Pg 5). The following provides the structure of the Pageant. Episode 5 Salem deluded by witchcraft. Witchcraft unveiled and driven out. Episode 2 The close of the Civil War. Entrance of the Grand Army of the Republic. The Pageant material names all of those who acted. The Finale includes various lists of prominent persons of Salem by category. The image shows a few of the participants. In the early issues, we included a list of Sources (love this page as it has the 2nd generation buttons which go back to the transition from OfficeLive (2010 start) of MS to HTML on Linux (2012). The issues related to configuration - technical and otherwise - are open - have not seen a real good solution - not Ancestry, thank you - go with Wordpress or otherwise - open to discussion). The last volume that we did in Sources was IV. 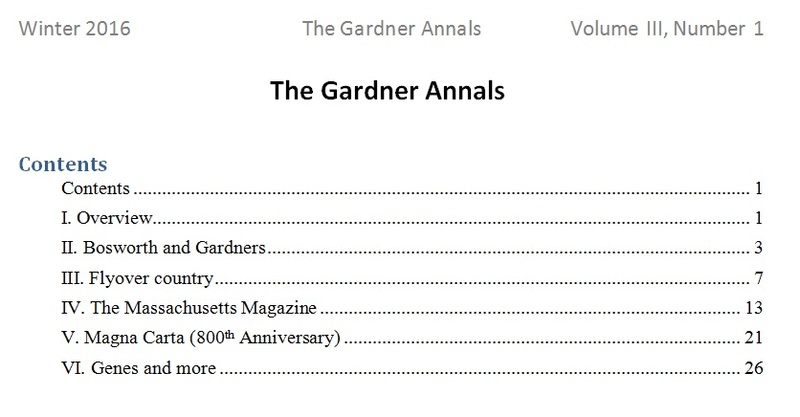 Some of the posts for the issue of Gardner's Beacon had a short source list of References (example - Gardner's Beacon, Vol 2, No 5). Found this A common place, an uncommon voice through this Short Reflections on The American Jeremiad. Related to this is Winthrop's view about the future in which he used being visible from a hill (as in, not hiding light under a bushel, if you would) as we all see of the U.S. (let's link to a view from 1888 - Some of the prominent prophecies ... out of San Francisco). Herbert B. Adams of Johns Hopkins: Village Communities of Cape Anne and Salem. Published in 1883. He uses material known at the time, some from the Essex Institute. Others will be added. At some point, Sources will reestablish the proper mode with a Bibliography. 06/27/2018 -- Looking at a common source strategy for GB and TGA. 07/13/2018 -- Added to the American Jeremiad bullet and inserted the H.B. Adams material, courtesy of Johns Hopkins (and Berkeley's library). This issue of Gardner's Beacon briefly looks two major events of the past four hundred years. We are just past Memorial Day with the 4th of July coming up. The respective wars were one hundred and fifty and two hundred and forty years ago. Given that Memorial Day has broadened in scope, one might expect it to become a major holiday celebrating more than the start of the summer months. It is natural that Thanksgiving will continue to be of interest. But, we are facing the start of a long line of celebrations. A century ago, people honored the 300th: Pageant of Salem (1913). Charles Dawes was there in 1926. The 400th of the Mayflower events is coming up in 2020; already activities have started to commemorate the lives of those who came over, prior to their trip west. 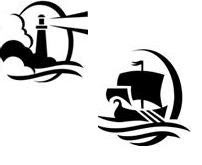 Cape Ann will be recognized in 2023 and 2024. However, there were several other occurrences that will lead to celebration: Roger's arrival (1625), then John's entry (1627/8), and Rev. Higginson (1629). It was the last who was the ancestor of Col. Thomas Higginson who is known for his work with The Massachusetts Magazine and the Old Planters Society, among other things. When 2030 comes around (Great Migration), there will be events at many locations for many years (Timeline of settlements). The print of The Gardner Annals, Vols III and IV, is in final preparation. We will report on the status. Included with the TGA volumes will be Gardner's Beacon issues from Vols IV through VII. 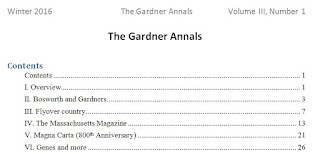 The issue will cover the remaining volumes of The Massachusetts Magazine, report on a change made via an article in The Essex Genealogist, and present further material from David T. Gardner. Too, we will look at a few of the Gardner Research projects. See Vol. VIII, No. 1 of Gardner's Beacon for a review of research to date. Sources.